...know then, that it is time to talk about how new Perpetuum players will experience their first hours in the near future. As you may know, this will be the third feature patch that we have planned before launching on Steam, after the already finished revamp of the research and assignment systems. I wanted to write "final patch", but we’re going to have an extra one, which will contain features and changes connected with our entry to Steam. Details for that will be announced during January - expect a few surprises. But for now, let’s see how the new tutorial stage will look like. For the veterans who don’t remember how our current start of the game looks like anymore, a quick recap: create your avatar, select faction, school, major, starting corporation, and spark. All that without the slightest knowledge of what your selections actually mean in a game that you haven’t played yet. We put a quick band-aid on this process recently by providing a selection of only four presets to the four factions with some general descriptions of what you can expect when you choose one. Still, looking at some shiny robot pictures and a few hints still isn’t up to par with experiencing the game itself. This became really apparent from the number of requests we get from new players who ask for a character reset after a few weeks of play, because they have realized they screwed up their character (although that is mostly a misperception, but that’s another story). And the only thing we can do is advise them how to bring out the best of their characters (read: let them rot in their misery), because any special reset would be unfair towards the rest of the players. So to remedy this problem, we’ll let you play before you actually play for real, and give you the opportunity to experience what this whole thing is about before asking you to make irreversible decisions. The initial character creation will consist of nothing else than creating your avatar (shh, it’s okay...) and giving it a name. That’s all, right after this you’ll find yourself in a terminal. Which is no ordinary terminal of course, but part of a virtual training program. Yes, that’s virtual reality inside a virtual reality. Perfectly normal stuff. Obviously, the Syndicate would never send the expensive spark of an Agent through a wormhole to the wilderness of Nia without proper in-house training. No Sir, that would be very irresponsible of them. That’s why they have created a whole virtual island, where every wannabe-Agent is sent to at first, cybernetically speaking. Being only virtual, the island is almost completely sealed off from the main Earth-Nia network. I say "almost", because the lovely Syndicate programmers managed to interlink the basic communication lines, so new and old can still chat about their experiences together. But other than that, nothing gets in and nothing gets out. Sidenote: initially our plan was to create solo instances for this, but as it turned out that would require too many core changes throughout the game, and we have decided that this is not the right time for such experiments. In some aspect there will be multiple instances of training islands, but these will be "hard" instances that we’ll use in conjunction with queuing and load balancing. However, this is not something that we could use for missions for example. But fear not, proper instances are still on our todo. It is literally a virtual playground where you can try almost anything without any second thoughts. We can do this without compromising the actual economy because as said, nothing gets out. 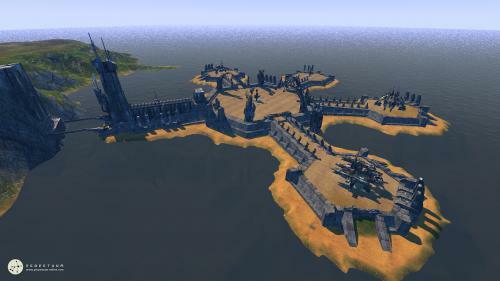 What you see here is a part of the training island, with a central in-zone entry teleport, and four exit teleports. Each one of the exit teleports represents a faction preset selection: choose one to go through, and the selected preset (extensions, starting location, etc.) will be applied to your character and you will be transferred through the wormhole into the real world. While that happens, your character will be stripped bare of everything you gathered or did to it while on the island. Except for the real-life experience you gathered of course - that’s something you should keep. Even though you’ll have nothing to lose, we won’t just simply throw you into the sandbox and let you figure everything on your own. Although I’m sure there are some who prefer it that way, we’ll provide some guidance in the form of a rookie-checklist. This checklist, as the name suggests, will contain a number of tasks that you should do to become a useful and successful Syndicate employee. This checklist will basically replace our current sequential tutorials, but it will cover much more than the current basics of movement/camera, targeting, module activation, equipping, etc. It’s pretty similar to an achievement system and the best thing is that you’ll be able to easily track and review all the tasks you have already completed. Reviewing them will even work after you have left the training island, so it’ll be a handy collection of quick how-to’s. And the part where I wrote "you should do them" actually means you have to do at least a percentage of them to get out of training. I know, alt characters and stuff, and we’ll try to make the limit as painless as possible, but there will be actually a reward for completing the tasks too. There will be a few milestones for specific stages of completion, and if you reach those milestones, your final character (the one on Nia) will receive some useful starting supplies, based on how well you did during training. This could mean some ammo or module packs for the first milestones, but it could be even light and assault robots for higher milestones, or when you complete the checklist at 100%. I think it’s apparent that of the three, this patch is the most content-heavy, so that’s why we are a bit late with it. Testing of this new tutorial is slated for January, but that means a very tight schedule for us. Which brings me to why we didn’t really have time to prepare anything for Christmas. A good percentage of why we are late with something can be attributed to things that are sidetracking us (critical bugs, server crashes, exploding toasters), and we really want to get you more ingame buddies already. But once we’re there, I promise we’ll have a party. So apologies, crossed fingers, and last but not least, Happy Holidays for everyone!